Saturday June 4th, 2011 at 1:00 p.m.
Inclement Weather - check website for cancellation. Learn by Playing ! Boules provided ! Further Game Results: See below. End of Season but looking forward to the Spring. Great play by all. Congratulations on a fine year. in the 2024 Olympics. Wish them good luck. Sunday, September 21, 2014 at 2:00 p.m. will the the last official play of this season. Come out if you can, we will have boules available. You can always play on the courts anytime, and the Senior Center has boules available for borrowing. Stay tune for the start of our new 2015 Season next May. 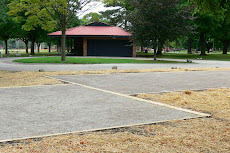 You can always get up to date info on this web site, and we will be restarting the Pétanque Ann Arbor Meetup site in the Spring on Meetup.com. À bientôt. Congratulations to Peggie who played and won her first game. Congratulations to Randy and TomS for making big gains with triple wins. Welcome Joe; your bocce skills really helped. Looking forward to seeing James' new boules; hoping for a speedy recovery. Anyone want to take my place in the Zanesfield tournament; I have already paid the entry fee. After play, we had a great wine & cheese get-together at Jeanne and Larry's place. Thank you so much. 3 Howard; 3 Lance; 2 Shannon. We had 17 players in good weather despite some threats of rain. Welcome Émile , Fred, and our Toledo friends Shannon, Lance, Ashley, and Kyle. Great also to see Dorty & Mike. Great group of 18 players. Welcome John, Jake, Ankit, & Sandra. Welcome back Laurie. Weather permitting, we will start at 2:00 p.m.
May 24 - May 25th - registration is required. (see Facebook page for exact details). June 8th - registration is required. $25 for adults; kids are free (see website for details). Hope everyone is rested up and ready for a new season. Weather permitting, we will start up on 13 May at 2:00 p.m. Note earlier time. Looking forward to seeing you soon. If you can't wait to get started, the courts are always open. Boules can be borrowed from the Senior Center or purchased at Arbor Vacuum on Packard. Results: Tournament of 23 contestants.